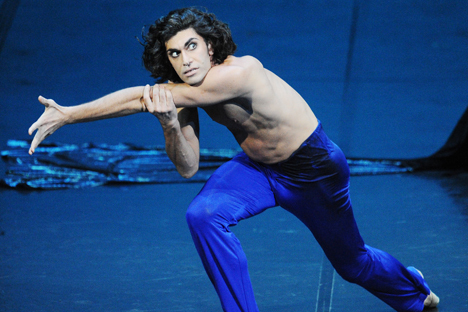 Nikolai Tsiskaridze will have to leave the Bolshoi Theatre on June 30. The ballet star claims to be hounded by management over a conflict after Sergei Filin, artistic director of the Bolshoi Theatre, became the victim of an acid attack on January. Nikolai Tsiskaridze’s last day at work at the Bolshoi Theatre will be June 30. He has been told that neither of his two contracts (he is both a dancer and a coach at the Bolshoi) will not be renewed. On Saturday, Tsiskaridze’s fans staged a picket in central Moscow, seeking to have their idol back on stage. The theatre’s administration is having none of it, though. The conflict began during the years when the Bolshoi Ballet was headed by artistic director Alexei Ratmansky (2004–2008). A remarkable choreographer and creator of his own ballets, Ratmansky was not interested in performing the classical ballets, including those staged by famous choreographer Marius Petipa. Tsiskaridze was very forthcoming in his criticism of Ratmansky and compared his work unfavorably to Petipa’s. Tensions subsided in 2009, when traditionalist Yuri Burlaka became artistic director of the ballet company. Like Tsiskaridze, Burlaka believed that the classical repertoire was the main value of the Bolshoi. Two years later, Burlaka chose not to renew his contract and was replaced by Sergei Filin, which stirred up a new round of tensions. Filin focused on young dancers, who Tsiskaridze thought were not good enough. Meanwhile, Tsiskaridze’s student Anzhelina Vorontsova was receiving no serious roles. Yet these were internal spats that could interest only the dancers and a narrow circle of ballet enthusiasts. The active phase of the ballet war began in October 2011, when the main stage of the Bolshoi was supposed to be unveiled after a drawn-out renovation. Prior to the opening ceremony, Tsiskaridze criticized the quality of the reconstruction, and the administration accused him of telling lies. Since then, there have been no new roles for the dancer. In response, Tsiskaridze started to offer his opinion every time the administration did something wrong. His comments became especially vitriolic in fall 2012, when the contract of the Bolshoi’s general director, Anatoly Iksanov, was supposed to expire (it was later extended for two years). It was then that the “letter of art directors” was issued, with directors of major Russian theatres signing a petition addressed to Vladimir Putin, asking him to appoint Tsiskaridze instead of Iksanov. A few days later, some of them withdrew their signatures, and the Bolshoi administration accused the dancer of initiating the letter – a claim that Tsiskaridze denies. In January 2013, following the acid attack on the company’s artistic director Sergei Filin, the theatre’s press service said that Tsiskaridze might have been involved in the incident. The administration had to revise its position after the dancer threatened to file a lawsuit. The Bolshoi general director stated that he did not believe there was a connection between Tsiskaridze and the attackers, but the dancer allegedly contributed to the atmosphere that resulted in the tragedy. When Filin’s attacker – a career criminal by the name of Zarutsky – was apprehended and pleaded guilty, attention turned to dancer Pavel Dmitrichenko, whom investigators accused of having paid for the attack. The Bolshoi administration hinted that Tsiskaridze was involved – Dmitrichenko is the boyfriend of Tsiskaridze’s student, Anzhelina Vorontsova. Investigators thought that he could have been seeking revenge, because his girlfriend was not receiving roles. Tsiskaridze’s opponents in the Bolshoi suggested that it was him who prompted Dmitrichenko to attack Filin, in order to make his way to the coveted post of artistic director. The dancer was outraged and, in his interview with the BBC, called on the Russian authorities to fire the entire administration of the Bolshoi Theatre. The Bolshoi became tired of the verbal clashes with the dancer, and Iksanov decided to fire Tsiskaridze – the main star of the Bolshoi Ballet. Interestingly, Tsiskaridze’s remarks about the poor quality of the renovation at the Bolshoi were officially confirmed that same week, when the Ministry of the Interior announced that at least 90 million roubles (around $3 million) had been stolen during the reconstruction; a contractor responsible for electrical equipment took the money, but failed to do the job. Although it was the Ministry of Culture and not the Bolshoi Theatre that accepted the renovation, it was its general director who accused the dancer of lying and insisted that the renovation was fine. What plans does Tsiskaridze have now? He has not given any comments, but it is clear that he will not be left without a job. Some unofficial offers have already been made. Charles Jude, ballet director at the Bordeaux National Opera and a star dancer at the Paris Opera, is currently in Moscow and has said that he would be happy to see the Russian dancer in his theatre.